Game 3 of the National Basketball Association Western Conference Finals between the Houston Rockets and Golden State Warriors occurred May 20. The series was tied at one game a piece. In the first half, there were times when it was extremely close, but Golden State maintained control through the first two quarters as they led by 12 at halftime. Despite a valiant effort from the Rockets, the third quarter saw the game get out of hand and former MVP Steph Curry dominated for the first time during the series. After struggling in games 1 and 2, Curry scored 18 of the Warriors’ third quarter points on 7-7. All together, Curry scored 26 of his 35 points overall in the second half, hitting 5 three-pointers on 12 attempts. The Warriors continued to pour it on the Rockets for the rest of the game, outscoring them an unbelievable 72-42 in the second half. James Harden and Chris Paul combined to score only 33 points on 12 of 32 shooting. As a team, the Rockets shot just 40 percent from the field and 32 percent from three point land. On the other hand, the Warriors shot 52 percent from the field and 40 percent from downtown. The Warriors won by a final score of 126-85. Game 3 made this series look almost impossible for the Rockets to win considering the lopsided final score. The Rockets just didn’t look like they had the skill and mindset to compete with the powerhouse of the Golden State Warriors. Rockets head coach Mike D’Antoni heavily criticized his team after the loss. While the Rockets couldn’t have played worse that Sunday night, it was a different story May 22 in Game 4. Even though the Warriors did get off to a quick 12-0 lead to start the game, the Rockets played with much more intensity in this one. They stormed back in the second quarter to outscore Golden State 34-18 to take a 53-46 lead going into halftime. Curry, just like in Game 3, had a magical third quarter. 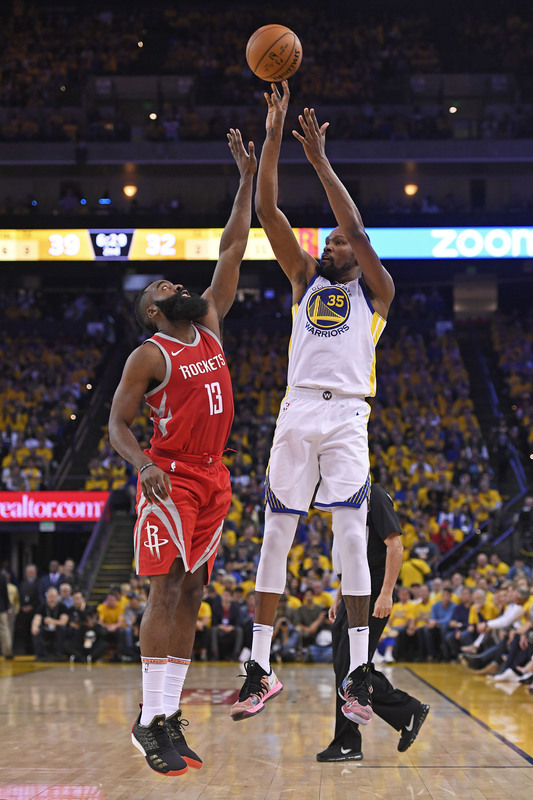 During a sequence in the quarter he hit three three-pointers in a row, helping the Warriors outscore the Rockets 34-17 in the third quarter and giving them a 10-point lead heading into the final quarter. The Rockets then went on a run of their own, outscoring the Warriors 25-12 through the rest of the game. While Chris Paul and James Harden accounted for 57 of the Rockets’ 95 Points, Eric Gordon and Trevor Ariza each hit big three-pointers late in the fourth quarter despite their early-game struggles. Steph Curry and Kevin Durant had multiple chances late in the fourth quarter to tie the game. Curry also missed a three-pointer with a half-second left that would have sent the game to overtime. Chris Paul finished the game with 27 points, four assists and two rebounds. James Harden contributed with 30 points, four rebounds and four assists. The Warriors looked to bounce back in Game 5 when the series headed to Houston May 24.